Luxury Corporate Bic Metal Ballpens are both slick and stylish for the desk and will stand out when placed near stationery items. The brushed metal finish is crisp and smooth to the eye, and the customisability of either a 1-colour print can be provided on either the centre barrel of the clip itself. Premium quality and service, the price to quality ratio is excellent, and you can choose from black or blue ink inserts! Why not hand these out to valued customers and clients for future business opportunities? 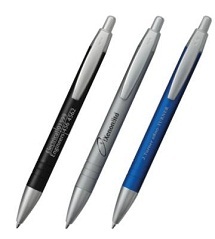 For a FREE QUOTE, please fill in the form regarding our Corporate Bic Metal Ballpens and we'll be able to help you.